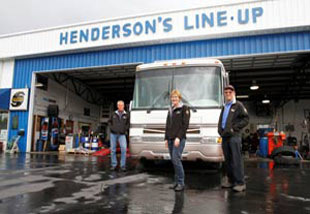 History - Henderson's Line-Up Brake & RV Inc. Since those early days, we have worked continually toward growth and progress to better serve our customers—with better people, better training, and the most comprehensive array of tools and equipment available. By the late 80’s, we began servicing the steering, suspension and braking needs of the recreational vehicle industry, which lead to many other opportunities. Because there were no products to solve the problems some of our customers were experiencing, we established our SuperSteer manufacturing division. We soon found out about the many variables in wheelbase, overall length, overhang past the rear wheels, and weight distribution—and realized that we had to find a “common denominator” of a good-handling coach. We subsequently designed a systemic approach to determine what the numbers needed to be to have a good handling vehicle. We trademarked the process and call it the Road Performance Assessment, or RPA. Today, Henderson’s Line-Up offers a full-line of products designed for “Safer and Happier Driving”, whether from our SuperSteer division, or other trusted sources of quality products. We travel all over the country servicing trucks, trailers and motorhomes at various events, and have established a nationwide reputation for knowledge, quality products and the best possible service. Yes, a lot of things have changed since 1961, but some things remain the same, and always will. Things like honesty, integrity, and treating people fairly. Going the extra mile for our customers and providing peace of mind for them when they’re on the road. 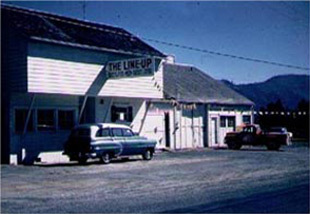 At Henderson’s Line-Up, we will always strive to think the best, give the best, believe the best and expect the best from ourselves and our customers.